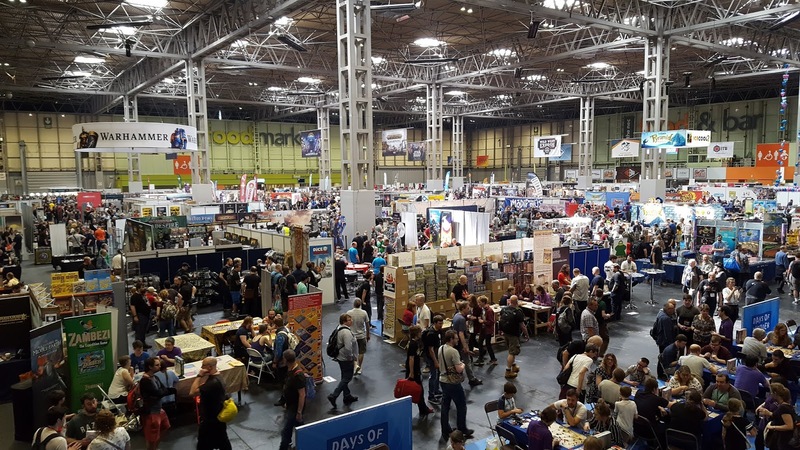 This year the UK Games Expo grew once again! There was more floor space, more open gaming and most impressively, a huge increase in attendance up to 21,700 unique ticket sales and turnstiles of 39,000. Maybe this year, UKGE will also surpass Origins which had 17,000 uniques in 2017 - that would make us the 3rd biggest board game convention worldwide!! 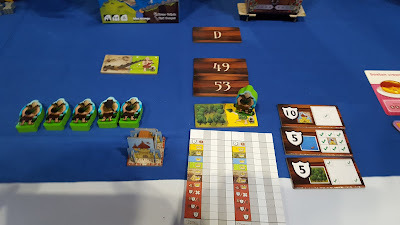 Kingdomino: Age of Giants is coming from Blue Orange games and Coiledspring Games here in the UK. It is an expansion to both Kingdomino and Queendomino. In addition to adding a 5th player to either game, it also adds giant tiles, giants must be defeated before the end of the game, otherwise the tile doesn't score. The expansion also includes variable objectives for end game scoring and a score sheet. 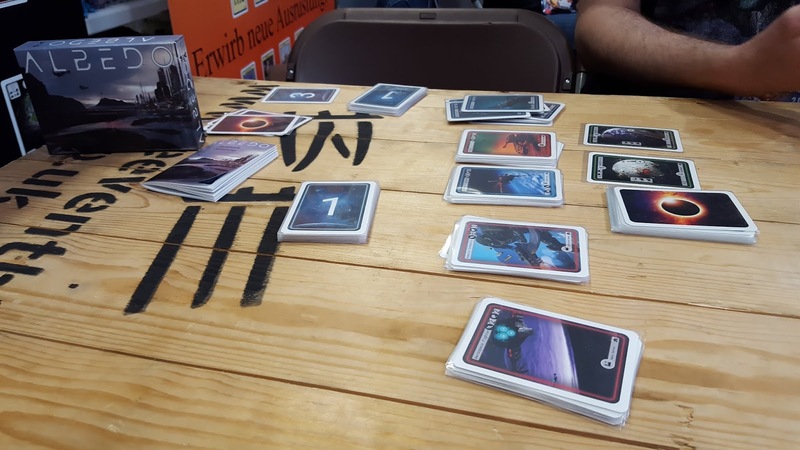 7 Wonders Armada is a new expansion to the ever-popular drafting game 7 Wonders. 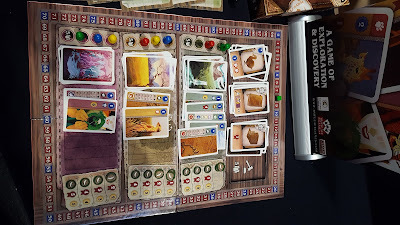 An extra player board gets clipped to the bottom of each player's wonder, each tracking the position of several boats. As you play cards you'll advance your boats based on the colour of cards played, each boat colour offers different rewards. 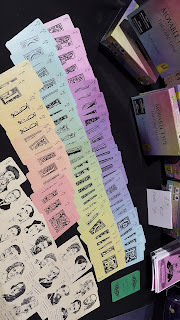 Just One is a cooperative party game, where players will take turns drawing a word so that everyone but them can see it. All the other players must write a related word on their stand. Players then reveal to each other and erase any duplicated words before the first player looks at the words written and guesses what the original word was. 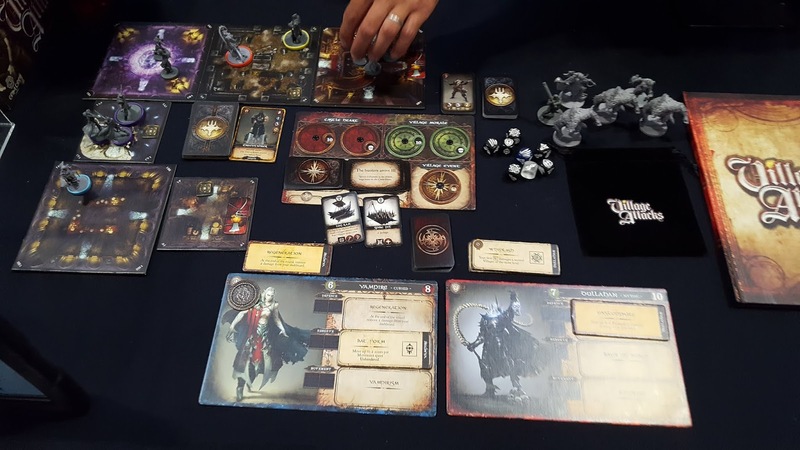 Warhammer Age of Sigmar Champions is being released by Playfusion, the creators of Lightseekers and is very much an evolution of that gameplay. There is no mana or other restrictions on playing cards. 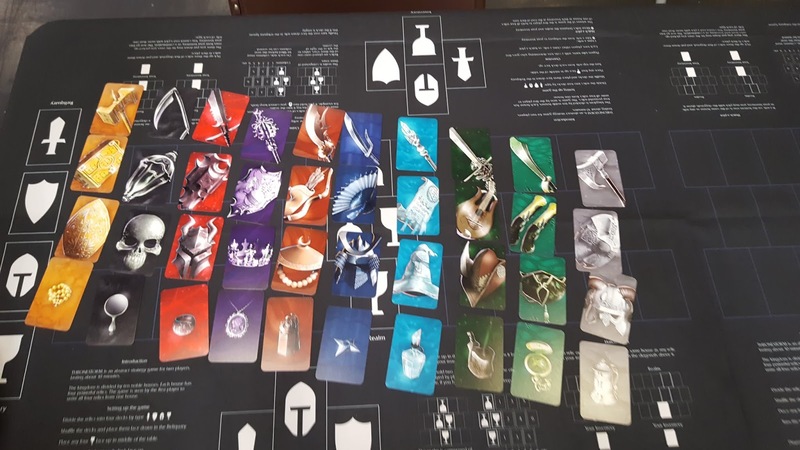 Each side has 4 heroes, the heroes demand certain cards to be played with them in order to spin them round 90 degrees, should you manage to spin one 360 degrees then you can unlock one of 4 powerful cards that can quickly change the game. Tales of Glory and Trool Park are both from Ankama games - a French publisher that was totally new to us, but published Krosmaster arena. Their games have really beautiful artwork and we're excitd to find out more about them. On Friday we booked our two big demos - Detective with Portal Games and Holding On: The Troubled Life of Billy Kerr, with Hub Games. This meant we didn't hit quite as many demos, but we still played some other interesting games. Holding On: The Troubled Life of Billy Kerr is a cooperative game about a man who is in intensive care after a heart attack. You are a team of nurses caring for Billy, as well as listening to his fragmented stories about his life. It's your goal to piece together his memories whilst providing adequate care and balancing the two. It's a bold theme choice and has some clever mechanisms, and is a really fascinating experience. 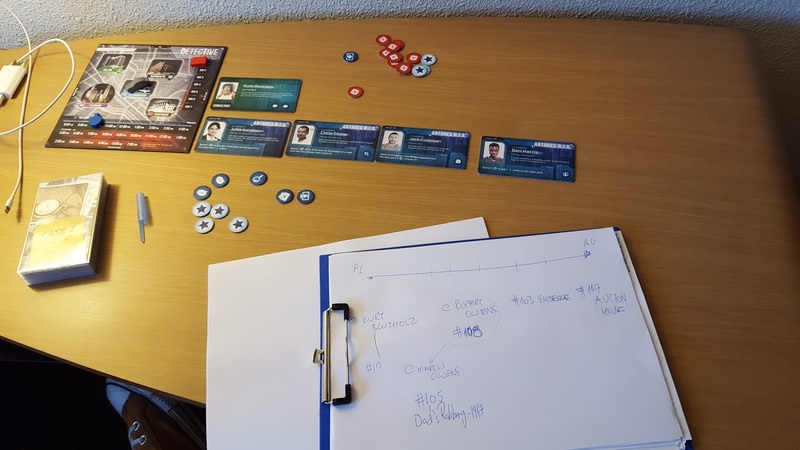 Detective: A Modern Crime Board Game is a cooperative crime drama from Portal Games where you play through a story campaign. The game utilities a website as the police database, allowing you to use a smart device or laptop to call up information on known criminals or to compare fingerprints. The game heavily encourages the use of a mind-map or, preferably, a cork board, pins and string in order to connect together how each of the characters are connected. Albedo is a small box deckbuilding game with some unique twists. First and foremost you have a deck of 9 cards and a hand of 6, so if you buy an new card on your first turn you might have it turn 2! You have to combine your space forces and ground forces to conquer planets in order to earn points, recruit new cards or trim your deck of bad cards. Expect a full review coming soon. Luxor is nominated for the Spiel des Jahres this year, so it was great to get the chance to take a look at it on the Queen Games stand. You race to get to the centre of an Egyptian temple to uncover the mummies therein, but along the way you'll want to loot as much treasure as possible. Luxor has a unique hand management system where new cards you drawn aren't actually available for a couple of turns, so the game really encourages planning ahead. Blue Lagoon is coming from Blue Orange Games and prolific designer, Reiner Knizia. Players take turns placing their tribesmen across a series of islands, points are rewarded for visiting as many islands as possible, but also for area control on each individual island, collecting resources scattered about the map and creating long chains of tribesmen. We played this near the end of the day and Amy walked away with the highest score in a 3-player game that day. 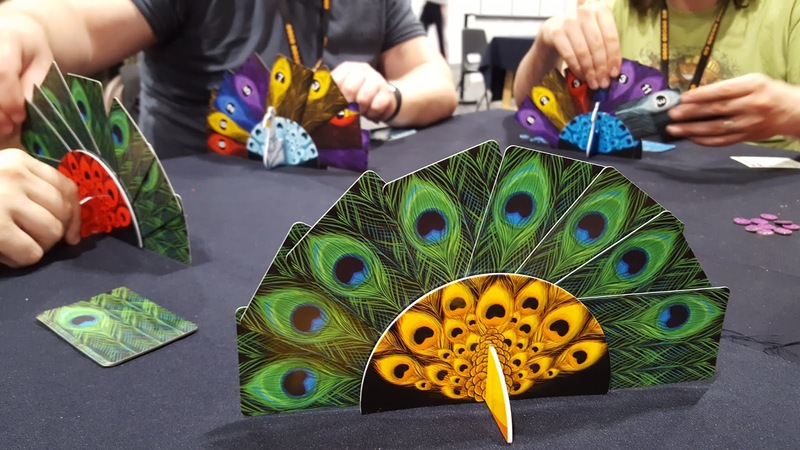 Pikoko is a trick taking game from Brain Games and designer Adam Porter. Your hand of 8 cards is a peacock with a plastic body and cards for feathers which just looks amazing. The gameplay is interesting as you bid on the number of tricks other players will take - you can't see your own cards, but you can see the cards of your opponents. 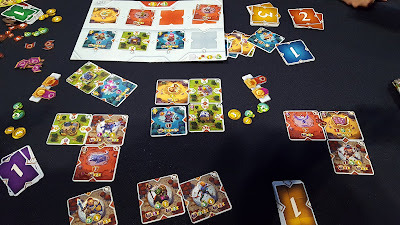 Pikoko is not innovative with it's trick taking mechanisms, but the way it combines bidding and the fact you can't see your own cards leads to some really cool moments. Expect a full review coming soon. On Friday, we made our main visit to the Bring and Buy. We queued for quite some time, that not as long as we saw many other people queuing for ans entered a room that was much bigger than previous years, but was still too cramped and full of people. Nevertheless, Fi loves the bring and buy - it's often a convention highlight. As our game collection and experience expands it's harder to find exciting titles, but we still walked away with a few. The Palaces of Carrara was a Kennerspiel des Jahres nominee in 2013 and then went out of print and there are very few copies available. I picked up a German version after giving up on ever finding an English copy! Multiuniversum was also £5. It's the first game that alerted me to Board & Dice as a publisher and I heard good things when it was as UKGE two years ago. Diamonds is a trick taking game that I've wanted for a long time. After quickly checking that it says 2 players on the side of the box, I'm just hoping it's not a bad two-player variant. Otherwise it might be an accessible game for the family. Mombasa was a game that we tried at Airecon, despite a... troubled rules explanation the unique hand management aspects really stood out and Amy decided to pick this up for £28. Not happy with just one heavy bag, we also hit the retailers. 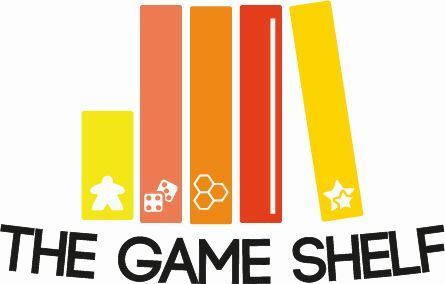 Apparently BoardGameGuru was the place to go for bargains and Meeple's Corner was the place to go for hot German games, like The Mind and Ganz Schon Clever. Sadly we hit neither because our sights were set on other hot games. 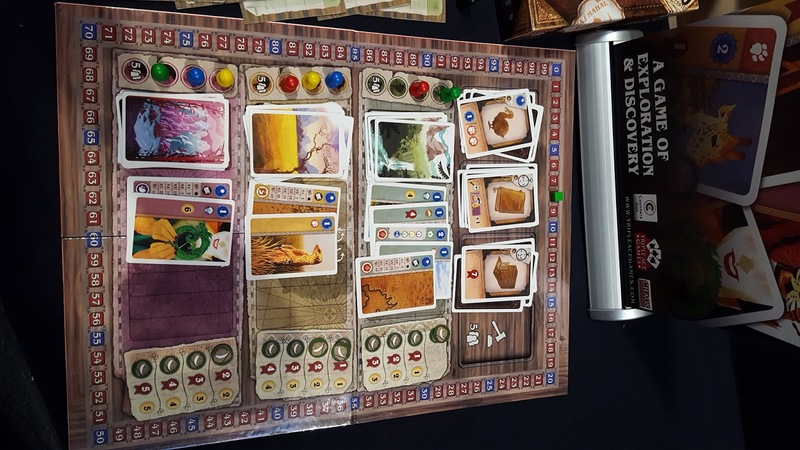 Century: Eastern Wonders was definitely one of the hottest tickets at the UK Games Expo. Each retailer reportedly had 15 copies, so we rushed to get one and succeeded. Spirit Island was sold to us by the most enthusiastic person at the press preview. It was lovely to hear someone so passionate about a game! It was unfortunately a little pricey at the Greater Than Games stand, but we snagged a good deal at Chaos Cards instead. 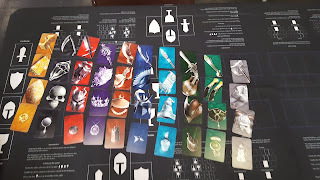 Getting a Gloomhaven insert was high on our priority list and after deciding we couldn't justify the high price tag for the Broken Token insert, we opted for a lightweight insert from Folded Space - purchased from The CCG and Board Game Social. Finally, we picked up a promo for Off the Rails - a Kickstarter that recently arrived on our doorstep. 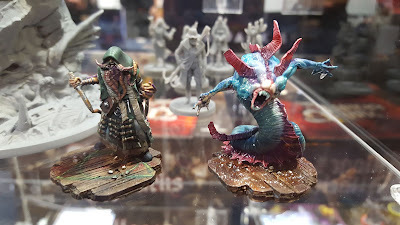 With so much to see, there isn't time to demo every game, but we also had some great conversations with designers and publishers and wanted to highlight a few cool games and sights we saw. 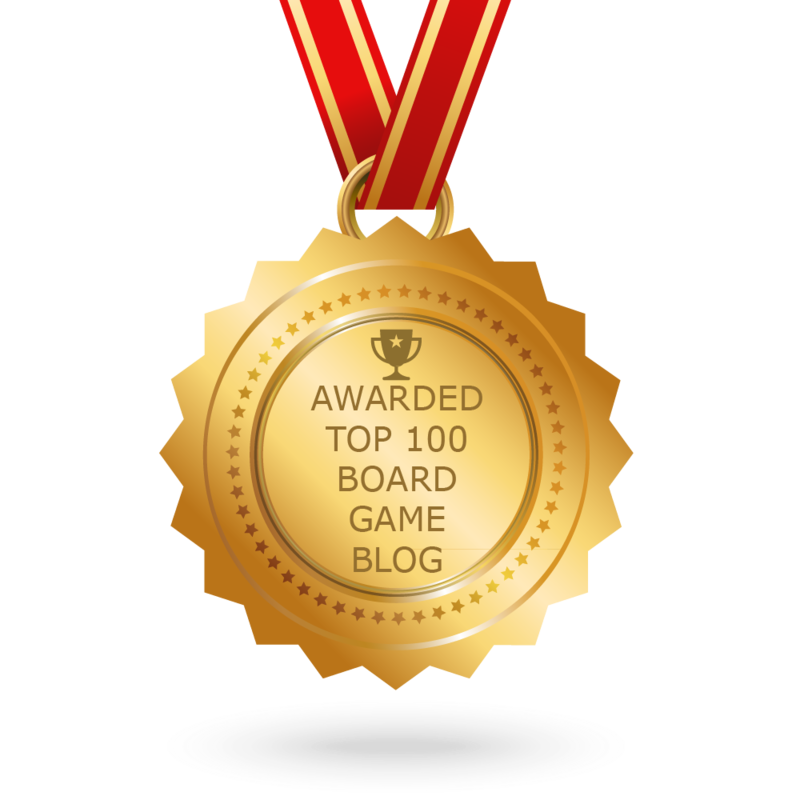 Thronestorm is a two-player card game designed to be quick and playable anywhere. Inspired by inventory management in classic RPG Baldurs Gate, you seek to get a matching set of gear for your adventurer while preventing your opponent from doing the same.. Expect a full review coming soon. Giant Ice Cool was definitely worth seeing, while the game still played mostly like it's normal self, sadly the giant penguins were too heavy to jump. Brain Games also have Ice Cool 2 coming in the future, as well as the Pyramid of Pengqueen, which is a retheming of an old Ravensburger title into the Ice Cool universe. Expect a full review of Pyramid of Pengqueen coming soon. Moveable Type is a card drafting word game. Each turn players draft letter cards and then try to spell the word worth the most points. In point order the players decide on two letters to keep for the final round. In the final round players do not draft, instead playing the the cards they saved up all game, the player with the best word in the final round wins. Expect a full review coming soon. Witless Wizards is a card game where you play as old retired wizards who have mostly forgotten how to cast spells. During the game you will draw new spell cards which you can either use yourself or give to an enemy, forcing their forgetful mind to lost their previously memorised spell. 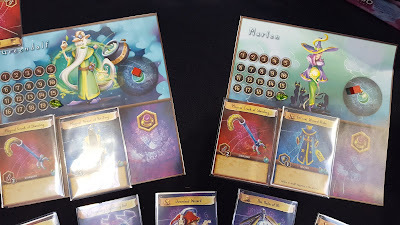 Exploriana is a game that we actually saw last year at UKGE, but now it's far closer to completion, with a rebooted Kickstarter expected in September. Players will start their exploration by auctioning for equipment before sending their explorers off into the wilds. Once exploring you must push your luck collecting rewards while trying to avoid getting either a pair of identical hazards or a complete set of 3 hazards. The Everrain is an upcoming Kickstarter from Grimlord Games. Players will work together in this exploration game to defend a drowned world from dark elder gods. Each player has their own ship and can recruit crew and upgrade their ship to better suit the scenario's needs. Village Attacks Is a cooperative Tower defense game where you play as classic horror villains trying to protect your rightful property from those no-good villagers breaking down your door with torches and pitchforks. The game comes with 10 scenarios with an optional day/night hard mode. Players use dice to determine their ability to move around the castle and fend of attackers and can customise their "hero" in multiple ways. Expect a full review coming soon. I took part in the first demo on Friday for Michael Fox, one of the designers of Holding On: The Troubled Life of Billy Kerr and he admitted he was nervous about the reception for the game. After 3 days of being one of the most popular demos at the UK Games Expo, I hope those nerves have calmed. I imagine that one of the main reasons it was so popular is because of its theme - it touches on a hard subject of providing care to a probably terminally ill patient which is somewhat controversial but is handled really well by the game. The cooperative mechanisms of the game are light, but you are working against a deck of card which will throw you medical emergencies as well as opportunities to talk to Billy about his memories and try and piece together his past. You gain partial memories throughout the game and piece them together as a jigsaw, and eventually you find the right lucid moments to push Billy to tell you the full memory. The art style for these memory cards is fantastic with the full memory revealing the clear picture from what is a board brush stroke, fuzzy image in the fragmented memory. There are 10 scenarios in the full game and each promises to build on your knowledge of Billy's life as you learn more throughout the game. 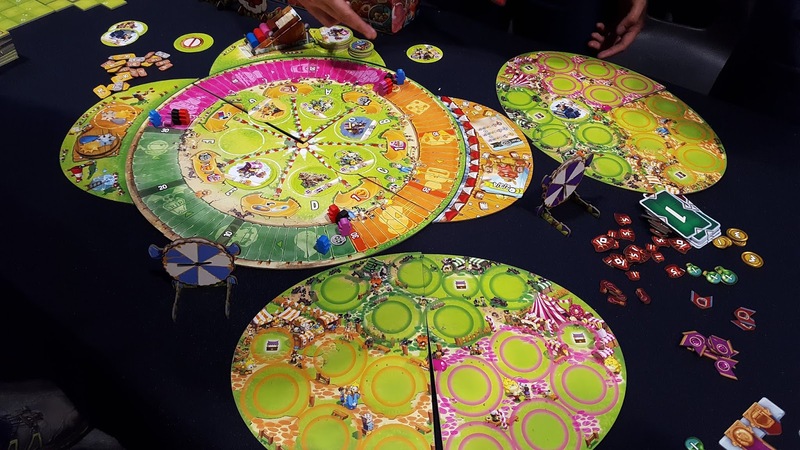 I'm fascinated to see how the game develops and hope it is a huge success for Hub Games. There is no doubt that Portal's game Detective is going to be a huge hit. While each game of the 5-game campaign is estimated to take about 3 hours (we took 2:15 for the first game), the rules are simple enough that you don't have to be a heavy gamer to enjoy it. One of the big selling points in Detective is that it's a fiction story set in the real world. Several events and groups referenced in the game are real historical groups/events and the game actively encourages you to look up information about them on Wikipedia. Doing so can help you find out if someone is stretching the truth a little thin. The game presents you with many leads to check out, but you only have a certain amount of time to crack the case. While we weren't caught out by any complete red herrings, some leads were definitely less useful than others, so manage your time wisely. Playing Detective really was a unique experience, everyone in our group immediately took up a role, from using the police database to managing the mind map. Detective succeeds in making you feel like you are really doing police work, and we're eagerly anticipating its release in a few months.